2 Days into January! 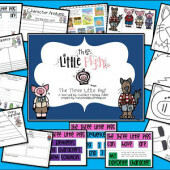 We have been working our fingers to the bone and thanks to my blog friends I have enjoyed some fun lessons! Here’s the highlights. Then we had a class meeting and I asked them to finish the sentence “First Graders…” It was the perfect way to remind them of all our class expectations. The best part is that they came up with it all themselves. Now they know- I know- they know…the rules…ya know? Their goals were so cute! 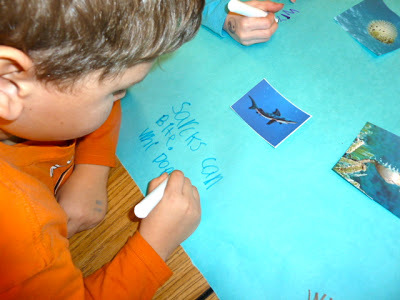 We are winding up our Ocean unit and this week we focus on the open ocean and highlight the shark! Here’s a peek at my Science Center. 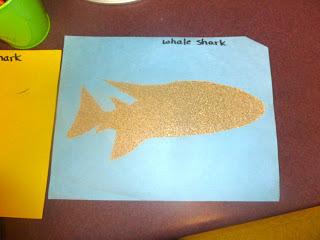 The activity for shark week is to make a shark rubbing of the different types of sharks. I just cut the shapes out of sandpaper and label them. The students do a crayon rub. I think I made 7 total sandpaper sharks. I tried to pick sharks with distinct looking bodies. This next activity is something I do for every new science theme. 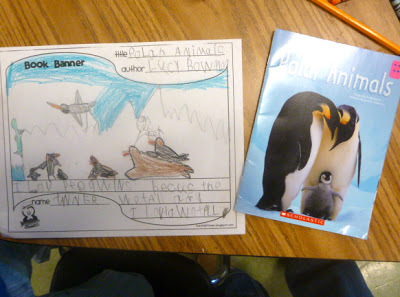 I place laminated pictures of whatever we are studying…insects, penguins, ocean animals, etc. on each table in my room. Then I place 5 markers on each table. when the kids returned from specials today, this is what they walked in and saw. I put on music for one minute as they walk around the room and look at all the tables without touching or talking about what they see. 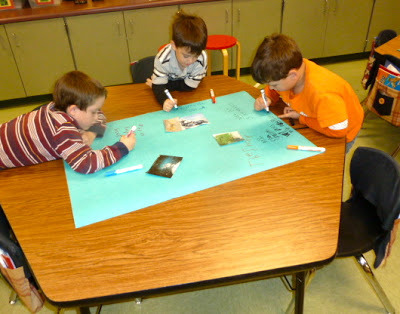 Then the music stops and they can go to any table and write a question or a comment about any of the pictures. 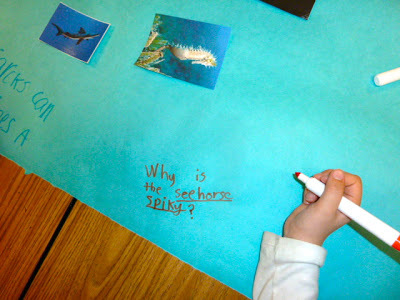 She wrote why is the seahorse spiky? They can move from table to table and their conversations are so great! I just love listening to what they say. They all try to answer each other’s questions. 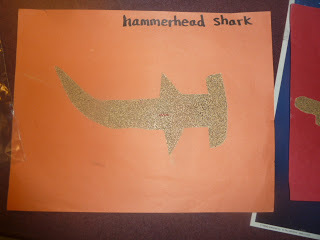 My class was in a very literal mood when we made this! We measured ourselves against this snowman wearing our spirit wear! Then we used post its with our names to graph our results. 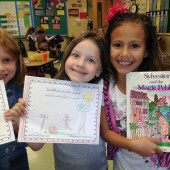 What favorite lessons are you doing this week? I would love to hear all about it! 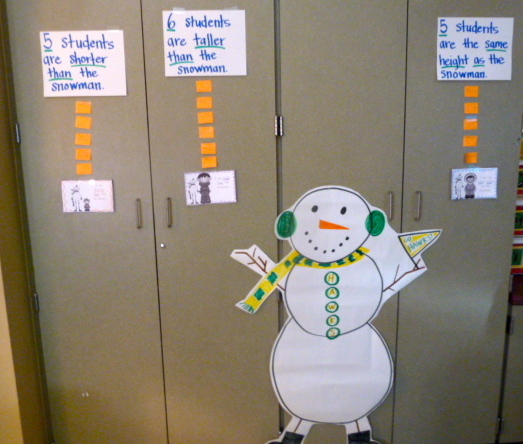 I love the snowman activity where the students have to measure themselves and compare!! I will have to do this! I already liked you as a person… but now… OMGollyMyGolly! I ADORE you as a teacher! This was like one of those "Best Practices" videos they show at PD. The thought of teaching "little kids" gives me a stomach ache, but you made it look like THE best place to be. WOW. The planning. One set of sandpaper sharks and I would be applying for a job at… well, anywhere else. That's a TON of work. I loved the hands-behind-the-back walk-and-look. (Sorry. Hyphen abuse). Sooooo sweet! It looks like your kids are having so much fun! I LOVE LOVE LOVE your Science Center. 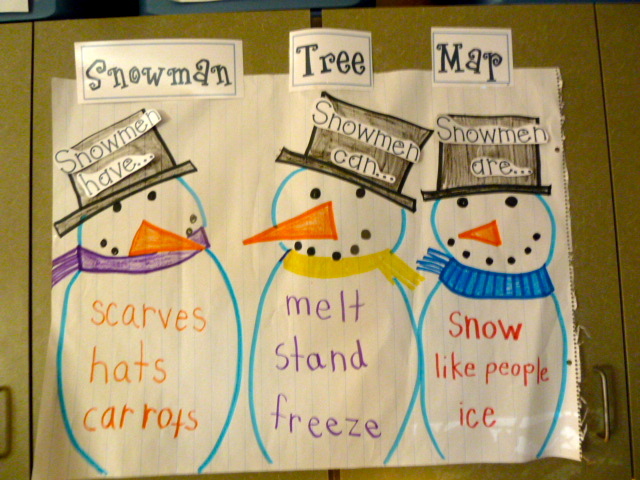 Measuring with the snowmen – too cute! And I love the posters/desk/walk around the room thing. FUN FUN! Good Lord you have done a ton in 2 days!!! I love it all and want to be in your class!!!!! 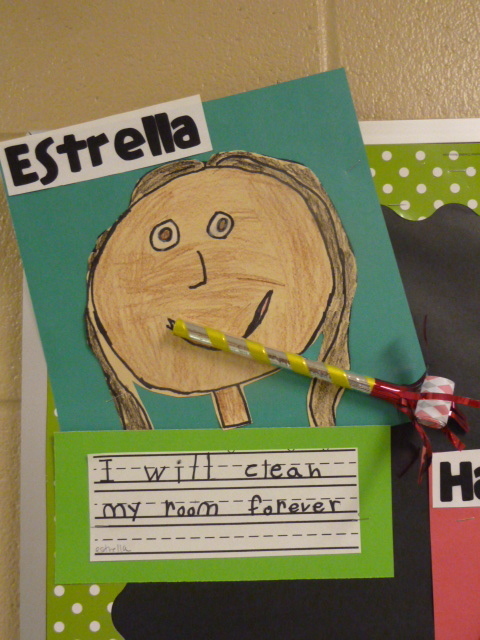 My 18 year old needs to take a tip from your student who "will clean her room forever"….too funny!!! Love it!! I really like your tree map and height activity!! 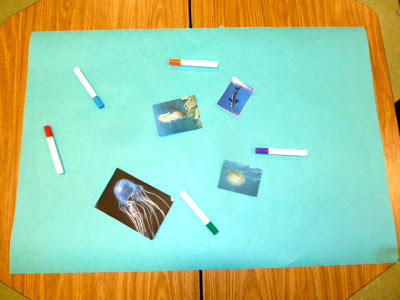 I love the "new theme" Science activity! What a great TPT I can add to my list! Everyone is involved and kick starts the unit by activating their prior knowledge…and gets them excited about what they will learn:) Thanks for sharing! 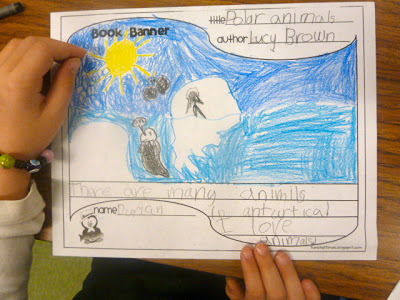 I love the science introduction activity! You rock! Amazing! Today was our first day back, and it felt like a good day. And then I read this and it seems like we got nothing [exciting] done…Thank you so much for sharing!!!! There's always tomorrow, right!? 🙂 Thanks again! 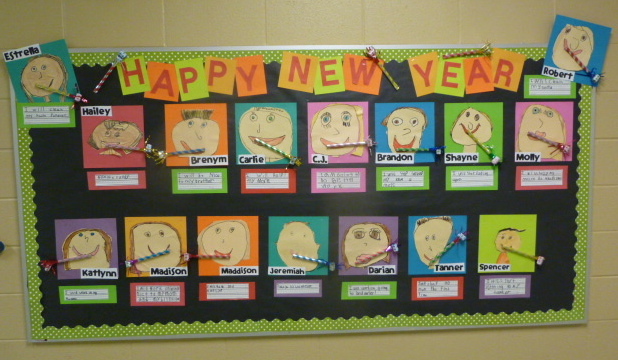 That Happy New Year bulletin board is UH-dorable!! Love all those fun things you have been doing! How do you fit this all in?? I got reading, writing, and math in today and didn't have any time left over! 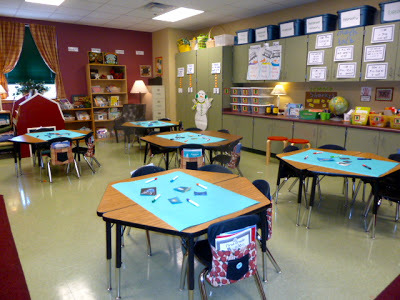 How do you do your science centers? Do you have curriculum you have to use or can you do your own thing? Girl I am just amazed by what you've gotten done in the past 2 days! You're on a roll! 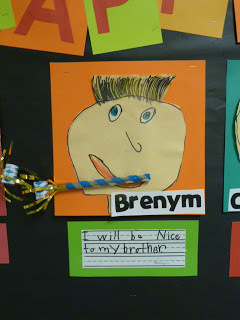 Love the New Year's Bulletin Board! What great ideas!! 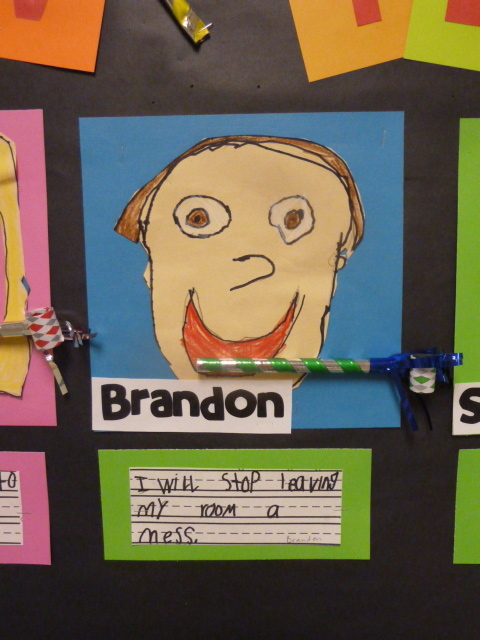 Gosh dang…those New Year's kids are PRECIOUS. Truly. Apparently, my kids were still on vacation today, so we'll be continuing our NY craftivity tomorrow. YIKES!!! Love it, girl!! 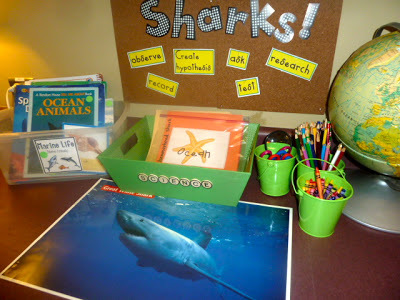 And LOVING those shark activities!! CAH-UTE!!!! 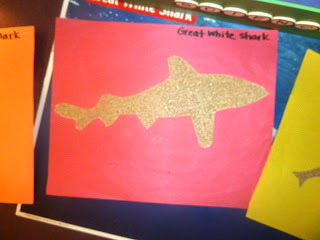 Those sandpaper sharks are so cool. 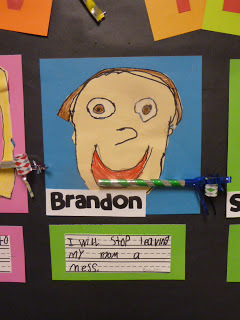 I teach third grade. 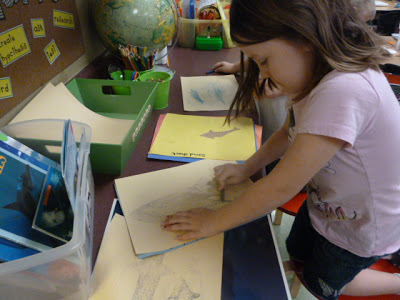 We don't get to do shark rubbings. Boo. Bless you for teaching littler people than me. Girl…you are ON IT! Love your New Year's craftivity! What a great day of learning! 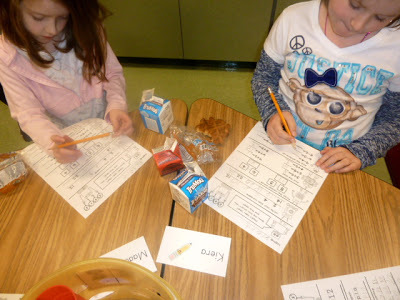 :) I loved the snowman graphing activity! I absolutely love the way you introduce a new science theme. So going to do this. Love your introduction to a new science unit… those kids walking around with their hands behind their backs… so sweet. 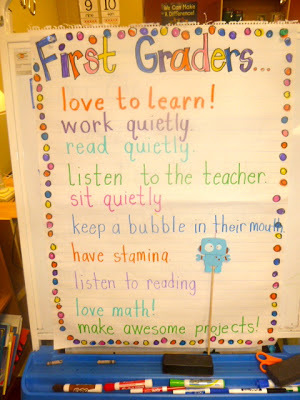 Gonna do the "First Graders" thing tomorrow. My kiddos seem to have forgotten a few things. Whew… what along day it was today. Reagan!!!!!!!!!!! I want to marry this post. Your resolutions are so cute and I love the idea of writing them on whiteboards first!! And I love your First Graders chart! And I love your science unit intro! I am totally going to do that! Yay, thank you for sharing your pictures!! Tear that snowman off the wall. It's TOOOO CUTE!!! Who! You guys have been busy! And here's another highlight-YOU won my Starbucks giveaway! Send me your address! You rock! 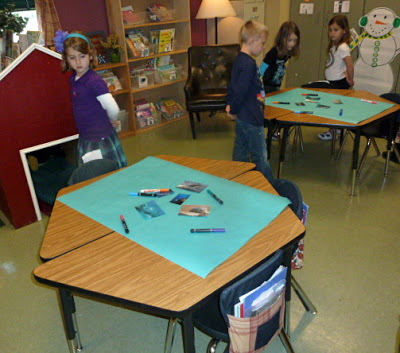 I am LOVING your science center and the sandpaper sharks! Too neat! I also love your intro to your ocean unit! How fun! I bet it is really interesting to listen in on their conversations and read their comments/questions. You have given me lots of good ideas! Thank you for sharing! Some really lovely ideas here. Had a pinning frenzy on Pintrest 🙂 Thank you. Your ideas and crafts are so cute!!! Thanks so much for sharing!!! By the way from what I could see of your room, it's so cute!! Love the homelike feeling of it! Holy busy – girlie!!!!!! 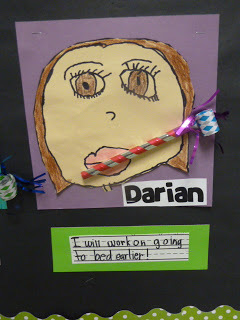 I love how your New Years resolutions turned out. I will have to remember your "new unit" activity where they walk around and write what they know or ask a question about a certain topic. LOVE…wish I had done that today with my plant unit. So cute! I love all of the pictures you share! I would love for you to come visit me. 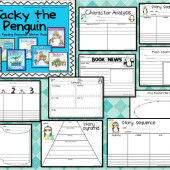 I have LOTS and LOTS of penguin and snowmen *freebies* right now! You have so many cute ideas! I'm saving this page because I don't want to forget any of them! Would you please post more about what you do for science? I would love to hear more about your science center. Do you do the walk around at the beginning of your units? Or just at the end? Thanks for all the sharing, and hats off to you and ALL you've done so far with your little cuties! ~Heidi V.
Your music/move around the room activity is awesome, thank you for sharing the idea!! I love your blog!